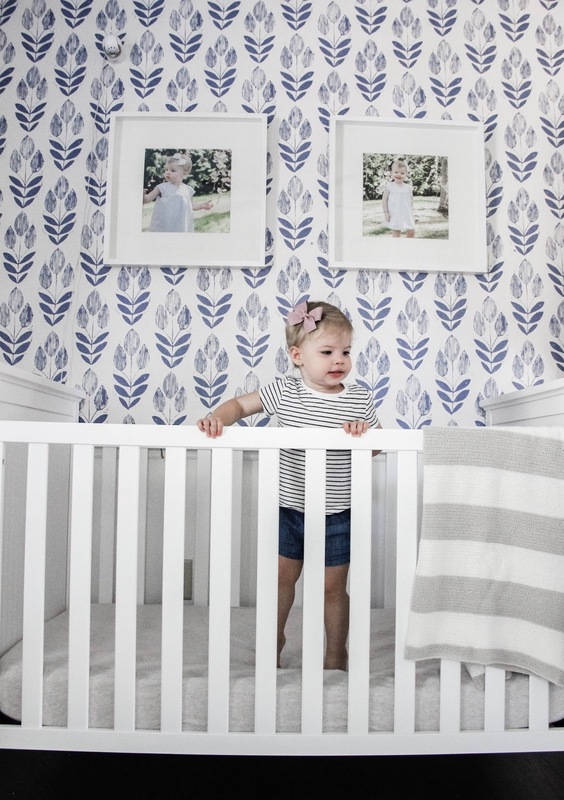 I am so excited to share Greer's nursery with you! It has been a work in progress since February, and it turned out like a dream. I have to be honest, I tossed and turned, so to speak, with the design of this space. And I felt like it was hard to commit to any one piece. 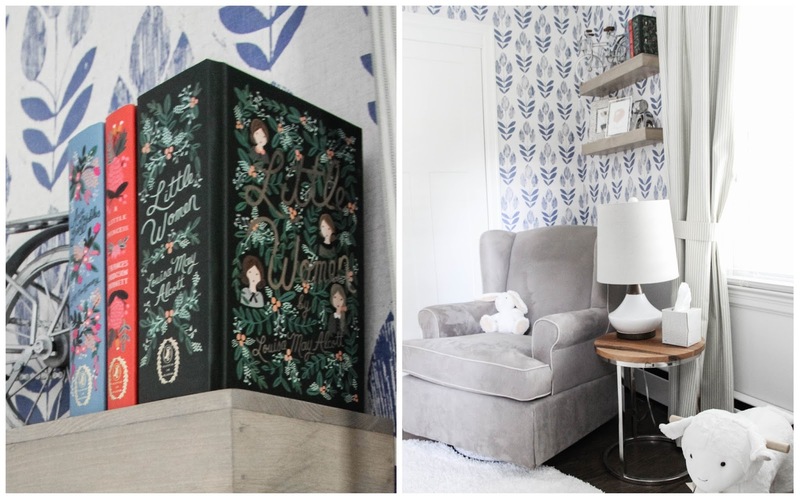 I wanted it to be bold, yet delicate and a room that Greer could grow up with too. I feel like I almost put this room together blindly, piece by piece, which resulted in a surprise reveal of sorts for myself. And y'all, I couldn't be happier with how it it turned out! 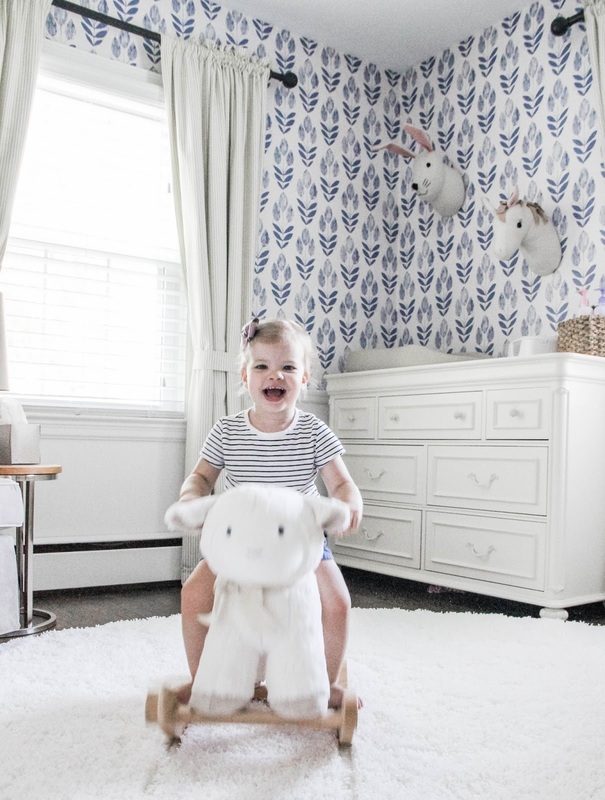 I have loved Greer's reaction to her nursery. She has been as much a part of putting it together as her daddy and I were. 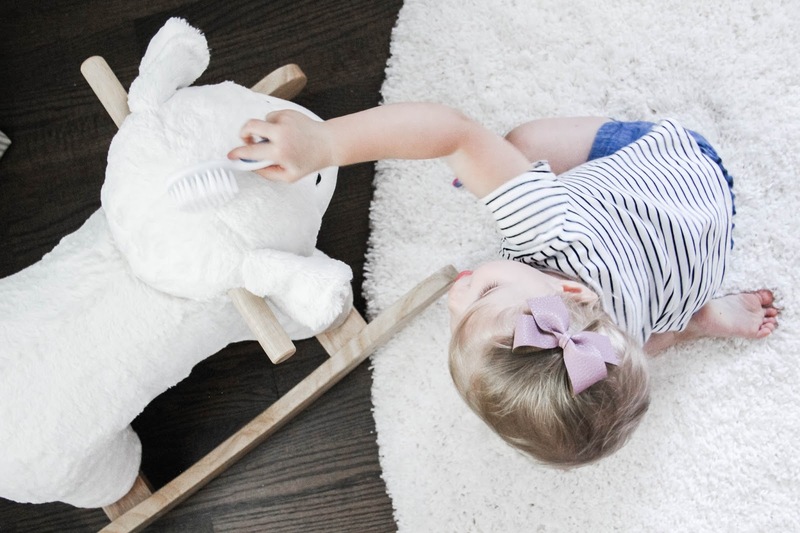 She would play in the floor while we wallpapered; watched as we painted and nailed in the chair railing; and cheered us on as we rearranged the furniture a couple of hundred times. My two favorite reactions from her are when we hung the stuffed animals on the walls, which she was thrilled with, and then after we got the shelves in place. Greer looked up at her daddy and said, "Tank you! Boo-ful!" And I about died in the very moment. Husband turned into one big puddle on the floor. Each piece in the space came together magically. From the textures and colors to the shapes and variety, each piece of furniture and every accent complements the one another. Greer's crib from Davinci Baby is a piece that I wanted to add to her nursery for its beauty and its fabric. Yes, fabric! The sides boasts a beautiful, puffed oatmeal fabric that I knew would help tie the room together, while also giving it dimensions. It's simple, yet elegant, which is exactly the kind of touch her room needed. I added a very special crochet blanket to the side of the crib for this reveal. Just before Christmas of 2014 and right after her 91st birthday, I asked my Grandmom if she would crochet a blanket for my future baby. I knew that husband and I wanted to start our family that next year, but she did not. And I also knew how badly I wanted to have a blanket made by her for my baby. She had crocheted me and my sister baby blankets when we were little, as well as toboggans for our little heads, and Barbie clothes for our dolls. It was a tradition I wanted to pass down. She kindly obliged my request, and one year later she finished that blanket and gave it to me when Greer was born. I could cry a river thinking about her, and I miss her terribly. But, oh am I ever so glad to have this little piece of her to share with my daughter. And how fitting it is that the blanket matches the room so very perfectly. 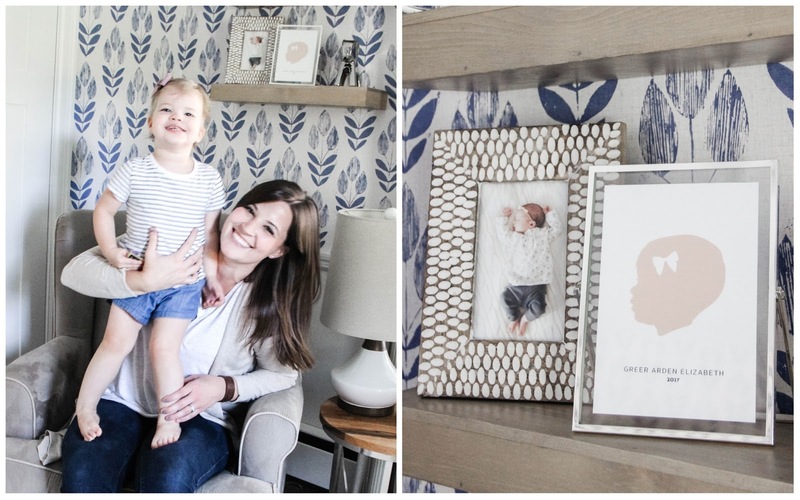 The photos we hung above her crib were the final touches to her room. As always, we chose MPix for our printed photos. The quality is surpassed by none, and they offer every kind of size you want, even these 12x12 prints for her large Ikea frames! Let me tell you a fun story about this stunning dresser. Her original dresser from Ikea was great, but for this space it just didn't fit well; it was too long. Nothing of exceptional quality at a fair price came across my radar. Then I decided to check craigslist, thinking if nothing else, maybe I would find an antique piece we could fix up. To my (very big) surprise, this beaut popped up. She is as sturdy and all-wood as she is lovely aesthetically. And I was charmed; so much in fact, that we went and picked it up that day. Best part about it, it was still in its original packaging, had never been used, and we got it for a major steal. You never know what you'll find on Craigslist, but I am now a firm believer in always taking a look! For all you expecting, hope-to-be, or new mamas out there. 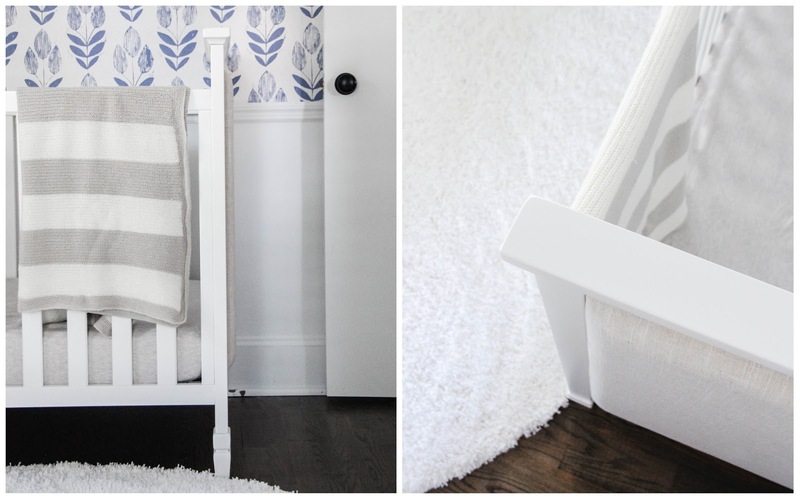 I cannot show you a picture of the Keekaroo changing table and not insist that you drop every last penny on one for your baby. It is amazing, and I am so thankful we splurged for it. When your baby makes a mess on it, all you have to do is clean it up with a baby wipe. There are no covers to take off and wash, no stains to be had, nothing. 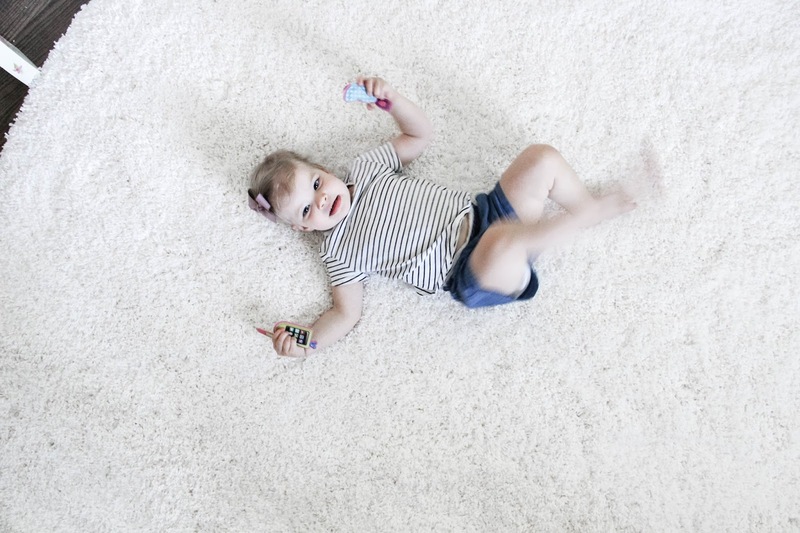 It is a no-hassle must for parents, and perfectly soft for baby. Not to mention, it is so minimal. This is not sponsored at all, it's just how much I love it. After we completed hanging the wallpaper in the room, the next step was putting the curtains up. 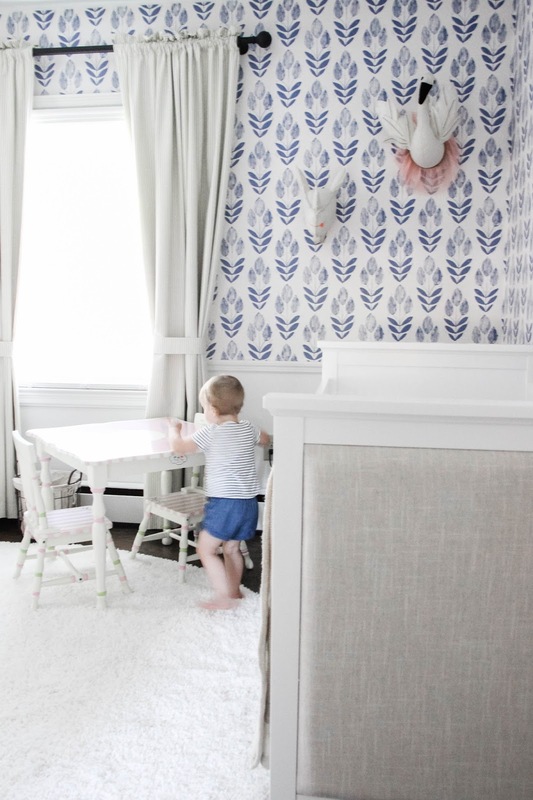 For a nursery, we wanted curtains that would keep all light out during sleeping hours. But, it was also important to me that they were beautiful too. The combination of the two is exactly what I got with custom drapes from Close to Custom Linens. I chose a lovely ticking stripe for a fun mixture of patterns, and also a little hint of southern charm. And while the front of the curtains is light and airy, the black-out liner behind it keeps it pitch black in her room when closed. Effective and pretty, my kind of accent piece! 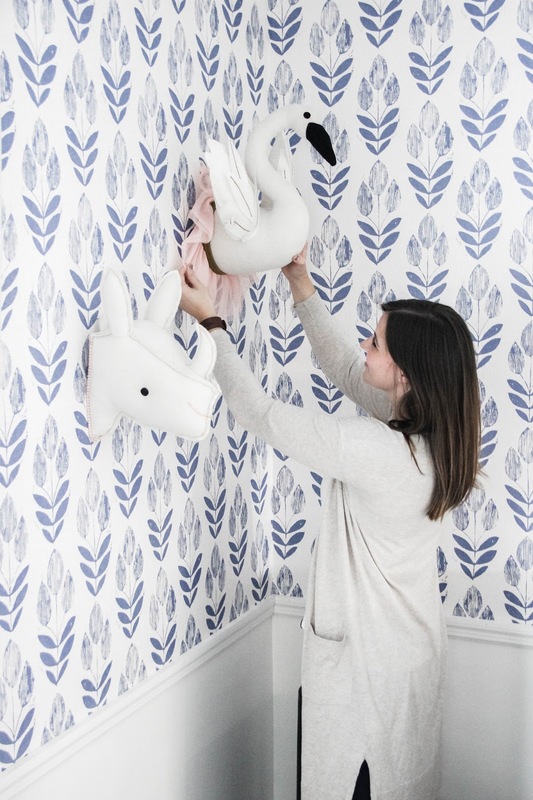 Don't you love the stuffed animals on the wall? I thought they added the sweetest, whimsical touch. And Greer is absolutely smitten with them. Every single night before bed and before nap time, Greer says, "Night night, bunny. Night night, corn (the unicorn). Night Night, bird (the swan). Night night, rhino." I don't know where she thought up to do that, but it is the most precious thing. I love seeing her adore her very own space the way she does. And speaking of adoring something, Greer has loved her flower walls from the first piece of wallpaper we put up. She loves to pat them and talk about the flowers. 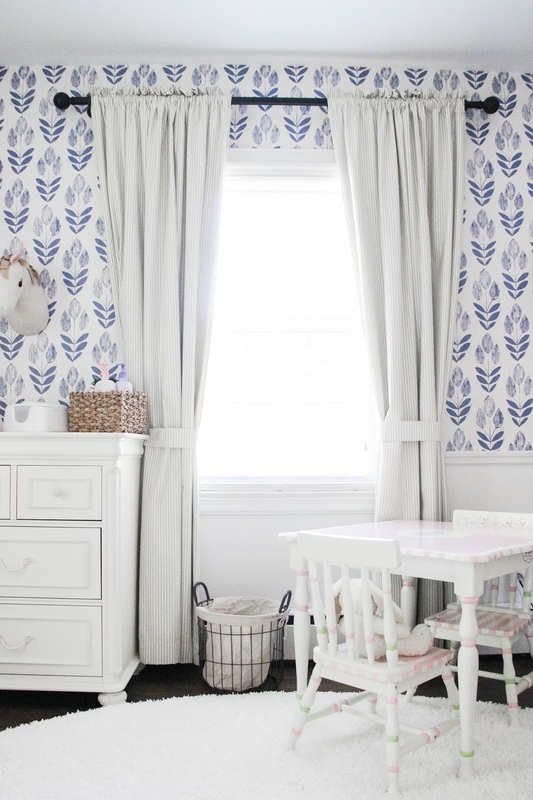 I'm so glad we chose the Scandinavian Block Print Tulip in blue for her room. 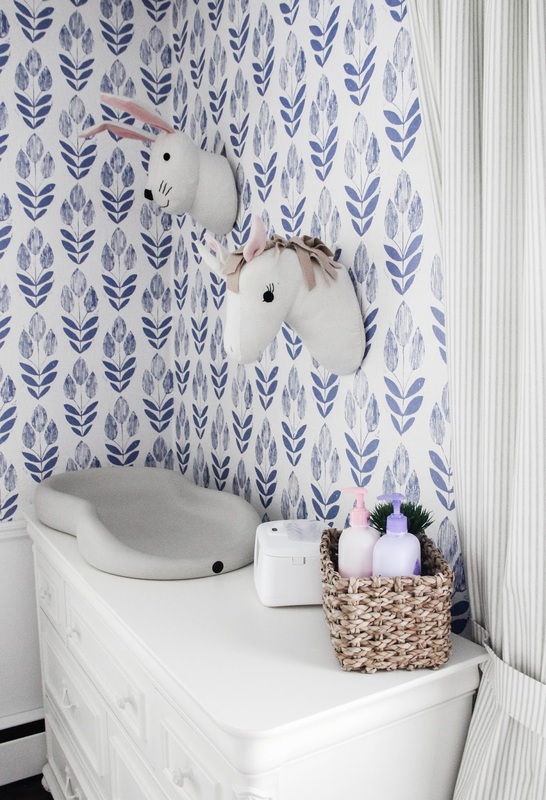 The pattern was a way to bring in a whimsical touch and a pop of color. 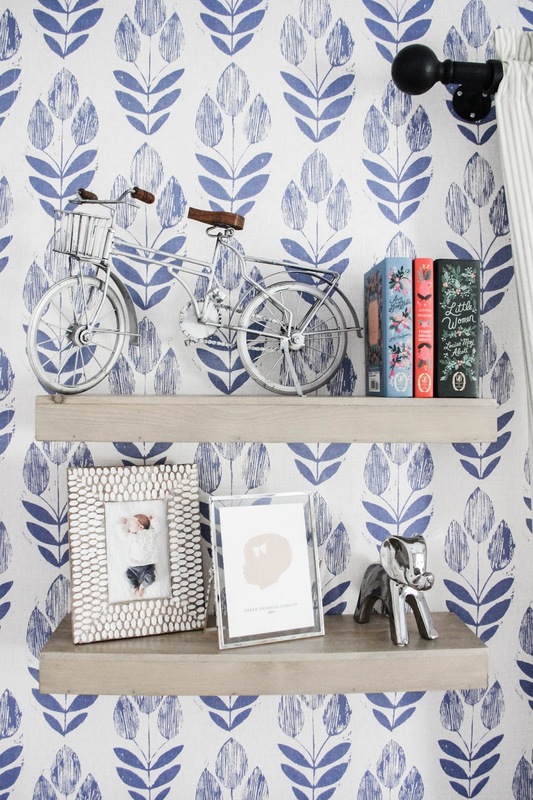 Brewster Home Fashions has the best selection of wallpaper, something for every space and every dream. 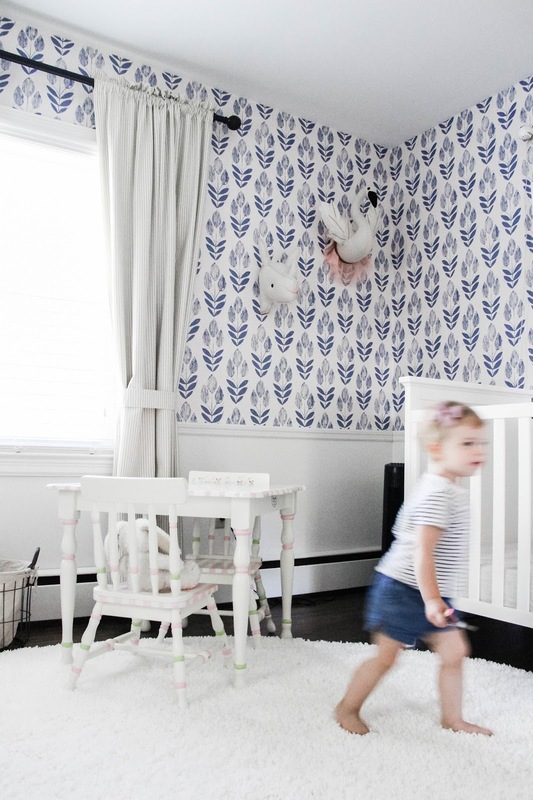 Just look how much this pattern impacted the nursery! You know something else Greer loves about her room? The shag rug. This girl loves to run in and throw herself (somewhat gently) onto her rug and pretend she is sleeping. Then she insists that we join her. I think she loves the plushness of the rug, and it has made a wonderful spot for her to play. When we were picking a rug to complete the room, I opted for round to break up all the sharp edges of the furniture, and I can't say how glad I am that I did. With a bold pattern on the wall and a pattern in the drapes, I needed a solid neutral to balance it all. This rug did just that! 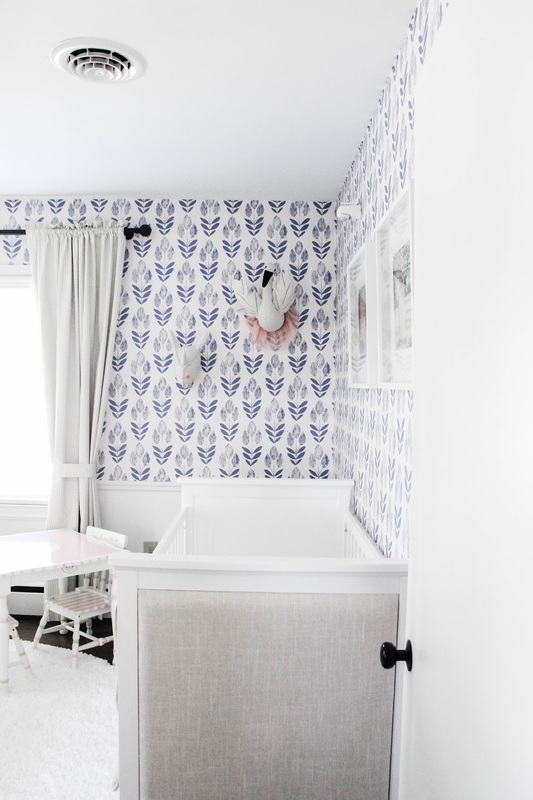 With such a bold pattern on the walls, I wanted to keep the accents we hung very simple, but also bold enough to not disappear amongst the blue tulips. So I went with natural, floating wooden shelves to hold special trinkets to add a little more color and some personal sentiments. One of my favorites is the silhouette of my one-year-old Greer that Postmark Studios did. It is so beloved, and I love having her tiny profile documented for always. Just look at it next a three week old Greer. My how fast babies grow and change! I'm over the moon with how well Greer's room came together. It is a dream to give my girl her very own space, one that she is just crazy about. I see so many sweet memories taking place in here! You can see the house + this room in a Before Post from when we first moved in almost a year ago! 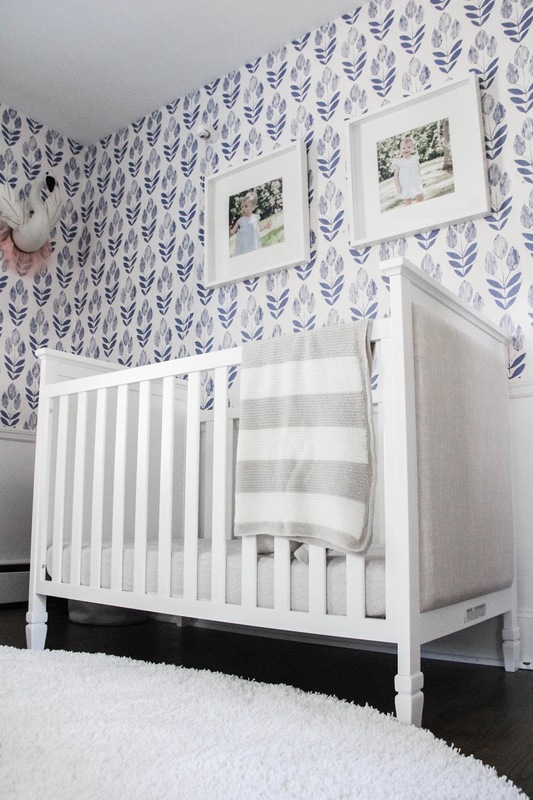 And remember Greer's Lila 3-in-1 Convertible Crib?? There's a GIVEAWAY for it happening on my Instagram!! Eeek!!! I can't even tell you how amazing this is! 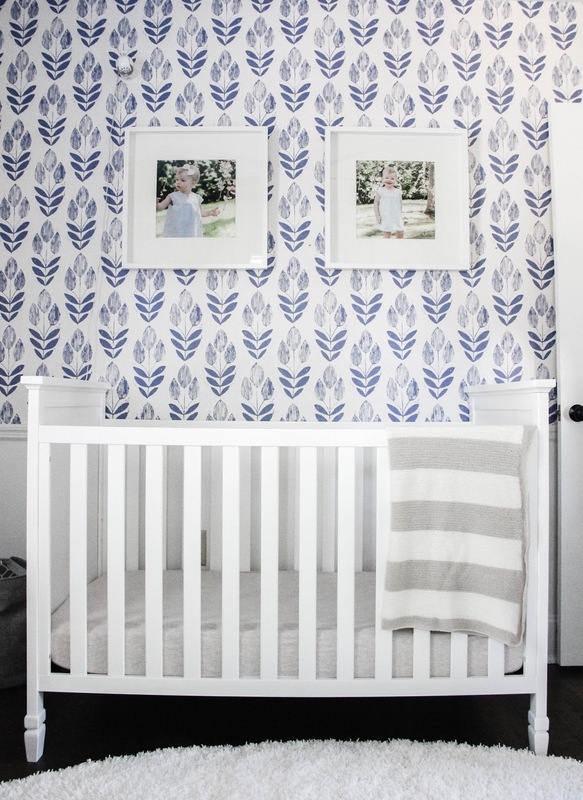 You could be adding this stunning piece to your little's nursery! 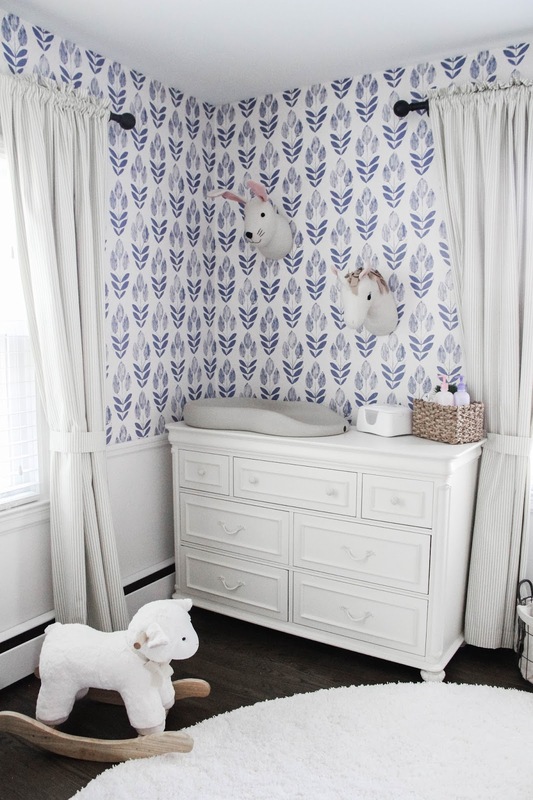 This post was sponsored by Brewster Home Fashions, Davinci Baby, Close to Custom Linens, MPix, and Postmark Studios. All opinions and photography are mine alone.